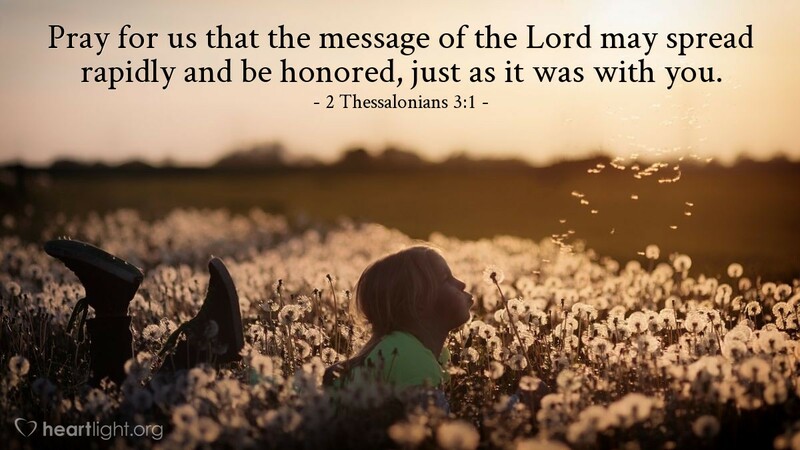 Pray for us that the message of the Lord may spread rapidly and be honored, just as it was with you. What can you do to help the spread of the Gospel and help increase the number of those who are saved each day? Well, there are many things: put in a good word for Jesus, share your faith with a friend, go on a mission trip, send financial support to a missionary, and many others. But one of the most important things you can do is to pray! Pray for missionaries and preachers and those who minister and share the Word of God and the grace of Jesus through the Internet, radio, television, and print. Pray for the message to spread rapidly and pray for it to grow in power and influence. Loving Shepherd, I know you agonize over those who are lost. I pray that you will empower missionaries worldwide to speak the truth of the Gospel with boldness. I pray that you touch the hearts of those who hear so they will experience your salvation. Use me in whatever way you choose to be a part of the spreading of your salvation. In Jesus' name I pray. Amen.